Can Donald Trump win ENOUGH union votes? Donald Trump likes to tout his "tremendous support" among union members. "Workers love me," he says. Union leaders are clearly worried. They have been out in force at the Democratic National Convention, rallying around Hillary Clinton. On Monday, AFL-CIO head Richard Trumka declared Clinton is a "champion of working people" and cast Trump as a rich guy who "outsourced America's jobs to line his own pockets." Most of the large unions -- AFL-CIO, AFSCME, SEIU, UAW and teachers groups -- are supporting Clinton and donating big to her campaign. Unions are among her top donors, according to OpenSecrets.org. In contrast, Trump has only been endorsed by two small unions: the National Border Patrol Council and the New England Police Benevolent Association. But Jeff Hester of Tennessee thinks union bosses are going to be shocked on election day. He sees a big disconnect between what union leaders are saying and how rank-and-file members feel. A few months ago Hester started the Facebook page "Teamsters for Trump." It already has over 4,000 likes. Hester is a member of the Brotherhood of Locomotive Engineers and Trainmen. It's part of the International Brotherhood of Teamsters, which has surprised many by not endorsing a candidate so far. "A vote for Trump solidifies our disdain for the establishment," Hester told CNNMoney. He says he voted Democrat until President Obama. "There is a new party forming, the Party of Trump." Hester estimates that 90% of the union families he knows are backing Trump. They're angry about trade, politics as usual and immigration. 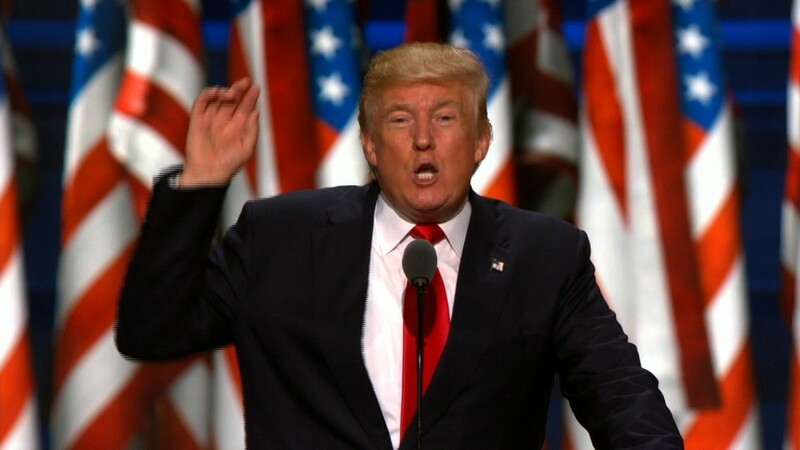 He thinks many are afraid to speak publicly, which could lead to a surprise on election day, much like the Brexit vote in the United Kingdom. The frustration of working class Americans is palpable, even on the Democratic convention floor. Numerous delegates have held signs and chanted "No TPP." They believe trade has killed U.S. jobs, and they don't want President Obama's Asian trade deal to pass. Clinton once supported TPP; now she's against it. Trump, meanwhile, vows to "turn our bad trade agreements into great ones." The key number to watch is the 40%. Historically, about 40% of union households vote Republican. That's held true since the 1970s, according to polling by NBC and the Wall Street Journal. Trump wants to beat that, much like Ronald Reagan did in the 1980s. Still, he might need even more than the union vote, especially in Ohio and Pennsylvania, two "must win" states for Trump. "The white working class vote is not sufficient," says G. Terry Madonna, a professor at Franklin and Marshall College and a long-time pollster in Pennsylvania. "Mitt Romney won every single old mining and mill town outside of Pittsburgh, but he still lost Pennsylvania." So far, the evidence isn't there that Trump is breaking through that 40% barrier. The most recent NBC/Wall Street Journal polling of union homes in May didn't show a big jump. However, the poll revealed something more alarming for Clinton: a big decline in the number of union households saying they'll vote Democrat. Normally, the Democrat gets 60% of the union vote, but this year, the poll only shows about 50% support. That suggests many union votes are still up for grabs. 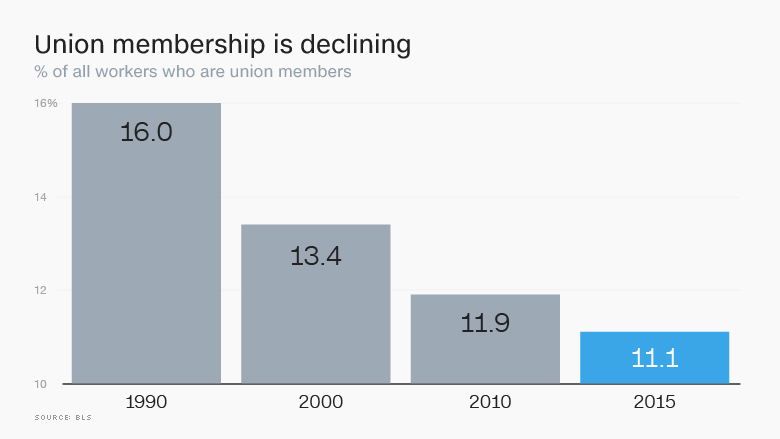 Trump is making a push to turn the union vote Republican at a time when union membership is declining. There are 14.8 million union members today, according to Labor Department, down from 16.3 million in 2000. "The irony is Republicans have done a lot with their policies to decrease the ranks of union workers," says Susan Demas, editor and publisher of Inside Michigan Politics. Trump is also trying to put Michigan in play. Demas points out that the state now has a "right to work" law that makes it more difficult for unions to convince workers to join. Many are watching Trump's support among unions as a proxy for his support among the working class more broadly. To win, Trump has to get just about every white, working class voter to the polls or he has to broaden his appeal. Union leaders are ratcheting up their attacks against Trump to point out how his record with unions isn't stellar (a lengthy Newsweek article called it "nuanced"). Workers at Trump's Las Vegas and Chicago hotels had to fight vigorously to unionize, and there have been legal cases in the past where contractors working on Trump's properties were accused of using illegal immigrant labor. But for union members like Hester, the key issues are much bigger than that. It's about border protection, jobs, and a cry for real change in Washington. "Trump will be a job creator," Hester says. "I was laid off for almost a year. My union has done nothing to protect our jobs."